November 11, 2018, marks the 100th anniversary of the end of World War I. Although the United States had only entered the war on the previous year, our troops played a critical role in deciding the outcome. Southern California’s impact, however, is a lesser known story. 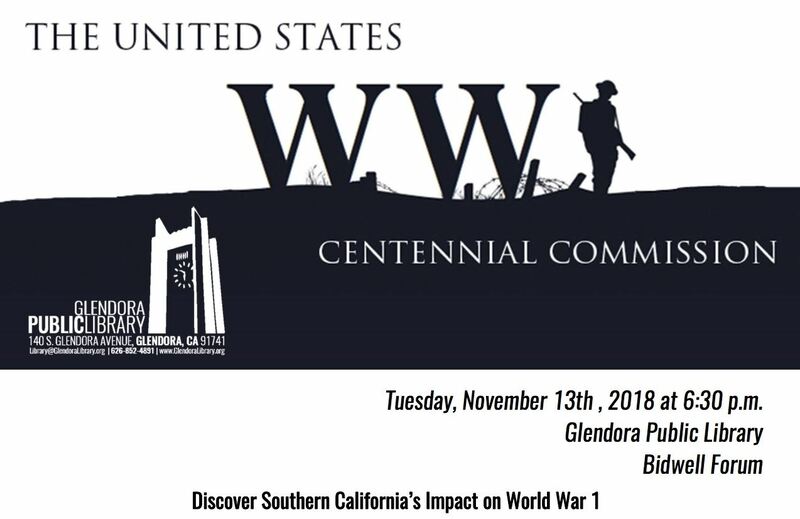 Courtland Jindra is an amateur historian and volunteer for the United States World War I Centennial Commission. His “Great War” interest is largely focused on America’s contribution to and remembrance of it. Please come to this event. GHS will have a table showcasing some of our WWI artifacts. For more information on this or other programs and services, please call the Library at (626) 852-4891 or visit www.glendoralibrary.org.